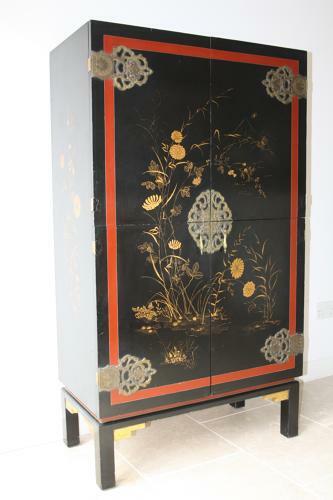 A good sized black and red lacquered tall cabinet decorated in gold leaf with details of flora and fauna, mountains and butterflies. Ornately carved hinges and door brackets are also very decorative. The four doors open to reveal the inside which is also lacquered in red and black with three shelves. French c1950.